This is the 42nd edition of the Bear Hollow Village Homeowner’s Association Newsletter brought to you by your Board of Trustees. This Newsletter will provide you with an update on things happening in our community and other information. Vehicles, or any attachments, additions, extensions to the parked vehicle, parked in Lodges at Bear Hollow parking spaces adjacent to Lillehammer Lane cannot extend beyond the Lodges parking space area and create a hazard to traffic on Lillehammer Lane. Oversized vehicles that do not fit into the Lodges areaparking space and extend into Lillehammer Lane, or anything from the parked vehicle extending into Lillehammer Lane creating a hazard to traffic or a safety concern will result in the vehicle being towed away at the vehicle owners expense. Vehicles, or any attachments, additions, extensions to the parked vehicle, parked in an owners private driveway in Bear Hollow Village cannot extend beyond the driveway parking space area and create a hazard to traffic on any private roadway in Bear Hollow Village. Oversized vehicles that do not fit into the owners drivewayparking space area and extend into the private roadway area, or anything from the parked vehicle extending into the private roadway area creating a hazard to traffic or a safety concern will result in the vehicle being towed away at the vehicle owners expense. All Owners are asked to please review and adhere to all our Vehicle Rules & Regulations as posted on our website www.bhvhoa.com . Common Area in a townhouse building; everything is someone’s private property and Owners need to have their property properly covered with insurance. Please check with your insurance provider that you have either a Homeowners Form HO-3 or HO-5 policy for your townhouse. Our project to create a new patio / lounging area outside the Clubhouse gated pool area is complete. has turned out excellent and we have received all positive feedback on its functionality and usage. We also added a safety feature where a person wanting to use the fire pit must first scan their Clubhouse access card on the scanner placed on the outside of the Clubhouse wall near the fire pit to activate the fire pit ignition. Card scanners were also added to each of the built in barbecue grills in the Village Green, again requiring a person wanting to use the grill to first scan their Clubhouse access card to activate the grill ignition. We have been very busy upgrading and enhancing the Clubhouse amenities and support mechanisms. The entire camera system was replaced with a new HD CCTV camera system. Cameras now cover all public areas of the Clubhouse, including the new patio area, fire pit and the barbecue grill patio areas in the Village Green. The pool area camera has panoramic and zoom in capabilities. The new card scanners installed on the fire pit and the barbecue grills were linked in to the computer system in the Clubhouse and the Clubhouse door. capabilities needed to run the new camera and card reader systems. The concrete surface area around the entire perimeter area of the pool was refinished with a new cool deck, non slip surface material, same as around the hot tub (which was refinished last year). We purchased and added two Adirondack chairs/side table made from old ski’s to the Great Room area. The air conditioner compressor servicing the exercise room and bathroom areas died and was replaced. A 3 tier rack to accommodate the free weight dumbbells in the exercise area was added. 2 New floor mat rugs with our Bear Hollow Village logo were added to the entry doorways. One of the large windows in the exercise room broke its seal and was replaced. placed on us by Summit Water. All lawn areas have been fertilized and treated for weed growth and shrubs and trees have been trimmed as per Owner requests. Owners are reminded that maintaining the landscape in the community is a shared responsibility between Owners and the HOA. We will be shutting down the irrigation system on or about October 2. All Owners that have an irrigation system control valve inside their home will receive a Notice from the HOA requesting their assistance in shutting down the system – this is just a first reminder. Your Trustees remind everyone that we are a mountain community and we share our space with the wildlife. mailed to Owners in July 2017. Make sure you pay the bill or the County has stated they will suspend trash and recycling pickup services for any property where the fee is unpaid. Direct any questions you have to Republic Services at 801-972-4234. Several properties have experienced ice/snow related damage to their roof / gutter / downspout areas in the past. If you do not have HEAT TAPE on your roof edges and gutters / downspouts you should consider having it installed. inspections and maintenance as necessary to ensure they are operating correctly and safely. If you have not had your fire sprinkler system checked in the past year it would be a good idea to schedule one before the cold of winter sets in. for your safety and for the safety of the community. preliminary reminder, all Owners will receive a Notice of the Annual Meeting and related documents in early November. should follow the guidelines included with this Newsletter. 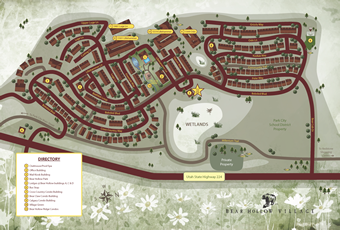 Please enjoy our amazing community and its amenities. Winter season is approaching and the mountain slopes are calling! Your HOA Board of Trustees !